In 2016, Kumamoto, on Japan’s southern island of Kyushu, was devastated by a series of earthquakes. With a large number of local residents displaced and living in temporary housing after the disaster, Nestlé Japan was quick to lend a hand, joining forces with Kumamon, the region’s black bear mascot, to boost morale and raise funds. The collaboration was an extension of Nestlé’s “Kitto Zutto Project” (“Sure to Continue Project”), which began supporting people in disaster-affected regions after the 2011 Tohoku earthquake and tsunami. 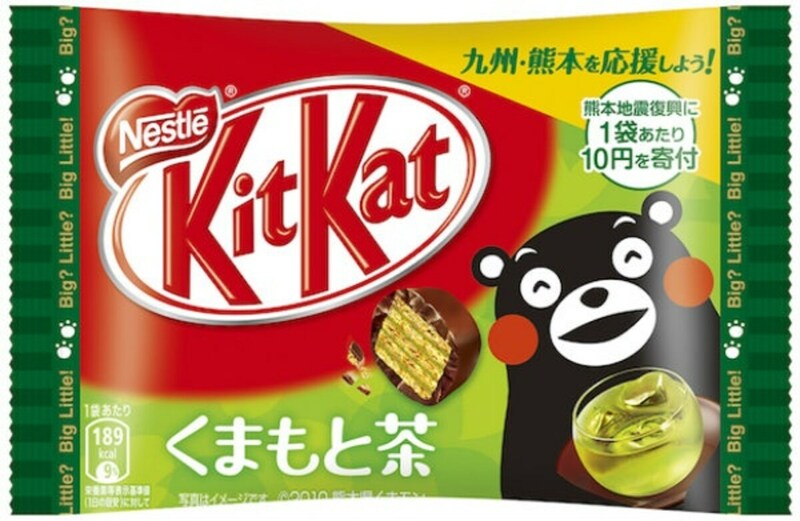 Following the disaster in Kumamoto, Nestlé came up with the idea for a Kumamon-branded “Kumamoto Tea” flavor Kit Kat, using local ingredients to help farmers, and last year they expanded the project with a yogurt-flavored Kit Kat to help a dairy damaged by a typhoon in Iwate Prefecture. The 2016 Kumamoto Tea Kit Kat raised ¥1.3 million (about US$12,199.61) in funds. 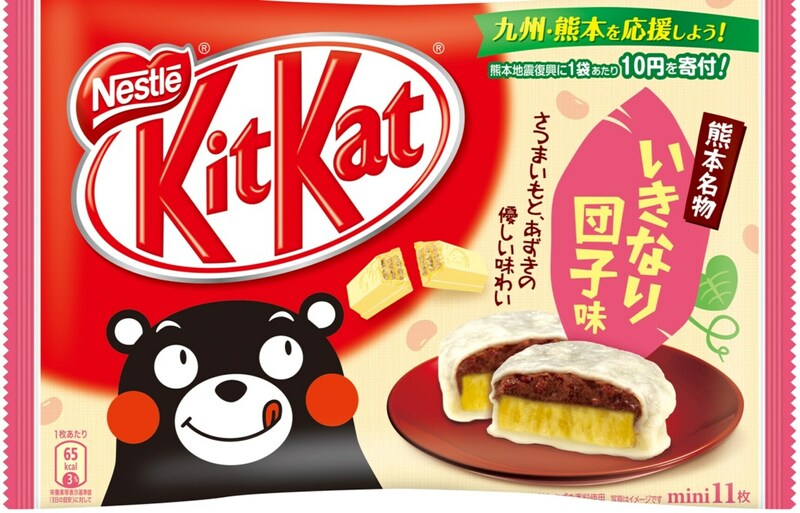 Now they’re back with Kumamon at the helm for another Kit Kat release in aid of Kumamoto Prefecture, and this time the chocolate comes filled with the flavor of ikinari dango. Ikinari dango (“sudden dumplings“) get their name from the fact that they’re so easy to make. Kumamoto is famous for these palm-sized steamed sweet dumplings, which usually contain a big round chunk of sweet potato covered in a red bean jam and wrapped in a thin layer of dough made from rice flour. The new limited-edition Kit Kats promise to deliver the same flavor of ikinari dango inside their famous chocolate-covered wafer bars. There are four different package designs to collect, with ¥10 from the sale of each 11-piece pack going toward reconstruction in Kyushu’s Kumamoto region. The packaging design pictured above features a coy Kumamon. ... as well as one that has a happy Kumamon. The same images of the black bear mascot appear on the individually wrapped bars inside each pack, with the addition of an adorable version showing him with his hands in the air, getting everyone excited for the new treat. In 2016, it was estimated that it would take around 20 years and ¥60 billion (more than US$550 million) to fully restore Kumamoto Castle, so purchasing the new limited-edition Kit Kats is one way for us all to pitch in and help with the reconstruction efforts. The Ikinari Dango Kit Kats have been available at stores nationwide since April 2, 2018, at a recommended retail price of ¥540 (about US$5.06), but who knows how long they will be here for, so you better grab one now!